Botanischer Name Phaedranassa dubia(Kunth) J. F. Macbr. Synonyme Collania dubia (Kunth) Schult. & Schult.f. ; Crinum quitense Spreng. ; Haemanthus dubiusKunth; Phaedranassa obtusa (Lindl.) Herb. ; Phaedranassa ventricosa Baker; Phycella chloracra Herb. ; Phycella obtusa Lindl. 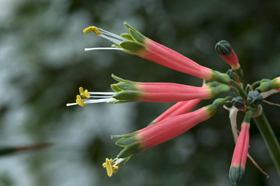 Besonderes: Phaedranassa is a genus in the Amaryllidaceae family which includes nine species, six of which are found only in Ecuador, the remaining three being from Colombia, Costa Rica and Peru. They are largely montane species, where they grow in disturbed areas, often colonizing road cuts, and usually coming into bloom after the dry summer season in their native lands. These beautiful bulbs are characterized by having leaves that are glossy green, greyish-green, or covered in a dusty bloom. 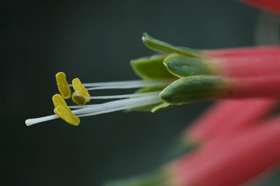 The flowers are produced in an umbel, most species having large tubular pink or red flowers that are variously banded in green, with anywhere from five or six flowers to fourteen or fifteen to an umbel.